After all the Diwali fried snacks, sweets, desserts, heavy meals, its time to give the tummy a rest and give it a good detox. Just the right theme at the right time, well thought out by Kriti who blogs at Krispy Kadhai. So what’s all this hype about detox water, detox soup, detox salad, detox meals, detox smoothies etc, etc. etc? Well, basically its more of a marketing tactic. None of them contain any magic formula or chemical to miraculously detox the body in a matter of 1 or 3 days. Our body is designed to detox regularly, meaning getting rid of toxins on a daily basis. For that to happen our liver and kidneys have to work perfectly. The liver picks up the toxins from our bloodstream (remember biology classes!) before the blood laden with essential minerals, vitamins, etc is allowed to circulate to the rest of the body. The liver converts these toxins into a water soluble substances which are then expelled from the body when we poop or urinate. In order for the liver and kidney to carry out their designated tasks, it is important to drink the required amount of water every single day. I sometimes don’t drink my required 8 glasses, sometimes I do, it all depends. Its natural that one does not feel thirsty when its cold. When we say 8 glasses of water, it means 8 fluid ounce per glass and half a glass does not count as 1 glass. In total that means ideally we should be drinking 2 liters of water. Ideally, its good to keep on sipping on water throughout the day if you’re not able to drink a glassful all the time. There are times when I find plain water so boring that I would just want to avoid drinking it and would prefer fresh juices. However too much of fresh juices add sugar to your blood. The first time I ever came across a recipe for detox water was on Dr. Oz television show where slices of cucumber, lemon and mint were added to water and where the audience was convinced that drinking that miracle drink will help to reduce weight. In reality adding fruits, spices, herbs, vegetables to water doesn’t basically convert it into a miracle drink for detox or weightless. What it basically does is that it makes water just that much more flavorful, more palatable and would have you craving for more. These days I’ve seen in many restaurants in India that jugful of water is served with sprigs of mint and lemon slices in them. The variety of colour that is added to the humble colorless water makes it attractive for kids too and my hubby who never seems to drink enough water. More often than not, I add the required ingredients into a 1 litre jug, top up with water and let it sit overnight in the fridge. Next day you have tasty water to drink to your hearts content. My green tea detox water is usually made in a glass as hubby is not a fan of green tea. I just keep on topping the glass with water. Works both ways for me, to make a whole jugful or to keep topping up the glass with water. As I mentioned above water is essential for getting rid of the toxins in our bodies on a daily basis. Here I have 7 different types of detox water for 7 days of the week. There is no hard and fast rule as to what you can add to the water. Use what is available in your area, town, country and what you prefer. Chop,slice the vegetables, fruits, add sprigs of herbs or the leaves. Add in whole spices if using any. Make sure the fruits, vegetables and herbs are thoroughly washed.The following quantities are to make 1 litre of detox water. Put the beetroot, orange and mint into a jug. Muddle them a bit using a pestle. Leave it at room temperature or in the fridge. Enjoy the naturally sweetish and tangy drink. Put the apple into a jug. Muddle it a bit using a pestle. Add water and cinnamon stick. Put the cucumber, lemon and mint into a jug. Enjoy the fresh cool drink. Put the mango, strawberries and mint into a jug. Put the nectarine into a jug. Add water and the infuser or tea bag. A great way to enjoy some freshly flavored green tea. Put the watermelon juice into a jug. Muddle the watermelon if you’re using pieces. Add chia seeds and water. Mix well. A filling and cooling drink. Put the coriander, grated ginger, turmeric and lemon slices into a jug. Muddle the mixture using a pestle. Add red chili powder and water. Mix well. A healthy glowing glass of healthiness, my favorite. Fresh herbs that can be used besides mint and coriander are basil, sage, thyme, marjoram, curry leaves etc. Use spices like cloves, cardamom, star anise, saffron, green chili (whole). Can use white tea, yellow tea instead of green tea. Use vegetables like celery, carrots. All the ingredients used tend to lose flavor by the end of the day, so its best to discard them or eat the fruit or vegetable used. Wow, love how you have come up with seven different types of infused water! Refreshing way to flush out toxins from the body! It definitely is Priya..thank you. Excellent share and these are not only detox ideas for a day, but an entire week, which is actually a must, considering how much we all have binged this festive season. Absolutely loved all the detox water recipes, each unique with a set of herbs and fruits. Thank you so much Veena, and yes its a great way to drink the required amount of water. Wow Mayuri you made me sspeechless. Awesome share. Detox water for whole week with different flavours. Saving this post. Thanks Sujata.. please try them, makes drinking water so much more fun. Thank you Jo Allison, it certainly helps me to drink more water and also helps to curb any sweet cravings. OMG!! love this. This is the best collection of detox water flavours. I so want to try the nectarine one. I can drink all the water you ask if you give me these…. Thanks Seema, try also adding peach. Its so delicious. This post is simply awesome di ! 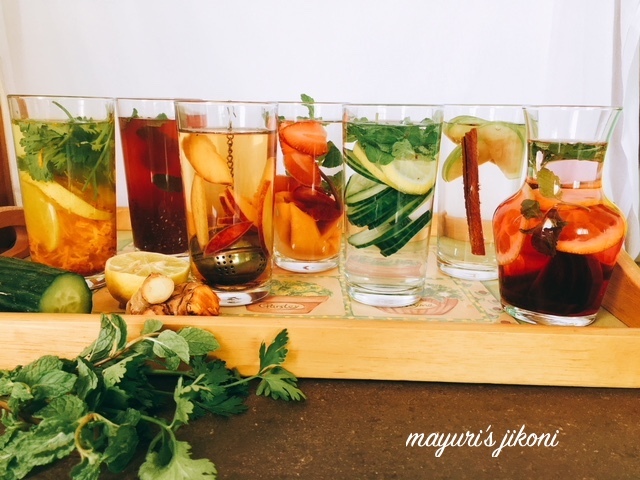 Detox water in 7 different flavors..love the combinations of spices veggies and fruits you have used here. Much needed after festivals. Thank you so much Poonam. Definitely a good way to detox. I love these variety of detox water. An absolute must after heavy feasting .Flavoured water keeps you hydrated . Many people who don’t like to drink plain water can have this flavoured water.Awesome share!! Thanks Preethi and its true it gets one to enjoy water. I never have trouble drinking “plain water” since my WW days. But I love all your suggestions for when I would like to kick it up a notch. Thanks for sharing with our special Fiesta Friday party. This is a brilliant idea, Mayuri. I see these jugs of water with lemon or cucumber or mint, at work places and restaurants and keep thinking I should prepare these at home. But I never get around to doing it. Now armed with your 7 lovely recipes, I can finally organise detox water for myself. Try them Sujata, even adding just mint, tulsi or fennel seeds, makes the water taste so different and refreshing. Thank you so much Jhuls. Like you I get bored with plain water and avoid squash as it often has too much sugar. These detox water recipes are going to be so helpful to me now. Love all your photos. Thanks Meena, also try adding valiyari to water, its so tasty. That’s what I’m doing to beat the Indian heat. Wow.. this is an interesting post .. 7 flavours of detox water.. we can try one each day .. not even boring to drink that way. Thanks Shobha, and yes a good way to get family to drink water, especially the ones who don’t like plain water. I love detox waters. My favourite is simple lemon and cucumber or mint. The best drink to have during hot days. These detox waters look really refreshing and tasty, They add colour to the glass too mkaing it more pleasing to the eye.